The BMC Racing Team was one of the most aggressive teams in the fourth stage of the Tour de Suisse, as the 188km course between Aarberg and Trimbach-Olten passed close to BMC’s headquarters town of Grenchen. Martin Kohler managed to get into the break of nine riders that escaped on the biggest climb of the day, the Scheltenpass approaching halfway, while Greg Van Avermaet was part of a late, three-man attack that almost made it to the finish. After suffering on the climb to Verbier on stage two, Kohler was happy to show himself in the nine-man move. It’s cohesion disappeared on the hilly finishing circuit, and the Swiss time trial champion was just unable to follow the attack of Omega Pharma-Quick Step’s Dario Cataldo on the strangely unclassified climb to Oltingen, which featured slopes of up to 20%. “I was feeling stronger today but the climb was just too steep for me,” he admitted, although he was rewarded with the consolation of the stage’s Most Aggressive Rider prize. Once Kohler had been caught by the peloton, Van Avermaet followed a counter move from AG2R La Mondiale’s Martin Elmiger, in pursuit of an attack from Team Sky’s Lars-Petter Nordhaug. They managed to join up with the Norwegian, but were ultimately chased down by the peloton with just under three kilometres to go. “Martin and I were working well together to catch Nordhaug but when we caught him, we went slower with three than we did with two,” the Belgian explained. “It was a bit disappointing that we got caught because it would be nice to win a stage here. 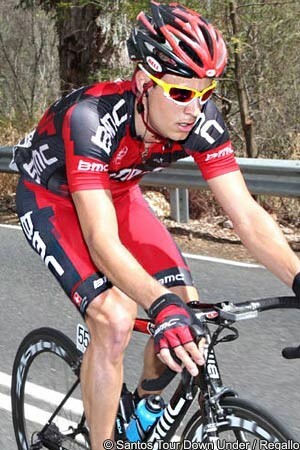 It's a ProTour race and one that's important for our sponsor, BMC. “It's hard to beat [Liquigas-Cannondale’s Peter] Sagan in a sprint so you have to try to do something else,” he added. Mathias Frank, who was on the attack himself in the kilometres before Kohler’s group was caught, held on to his Best Swiss Rider’s jersey. It was not all good news for the team however, as British sprinter Adam Blythe was forced to withdraw with a nagging pain in his upper thigh. "It was better to stop now than to injury myself any more," he said. "I hope to be ready for nationals."